Your overall marketing plan allows you to spend $100 per day across your three campaigns. Without shared budgets, you’d next have to decide how to allocate the $100 daily AdWords budget across each of your three campaigns. Say you set a $60 daily budget for your desktop campaign, a $20 daily budget for your mobile campaign, and $20 to your remarketing campaign. On most days, each campaign hits its daily budget and you’re satisfied with the ROI of each campaign. But on some days, your desktop search campaign sees fewer impressions and clicks than other days. So you only spend $90. On these days, your overall campaign results could be stronger if you were able to put an additional $10 into your mobile search campaign or remarketing campaign. Using shared budgets allows automatic adjustments across campaigns, so you don’t have to constantly monitor and change individual campaign budgets throughout the day. It’s simple. 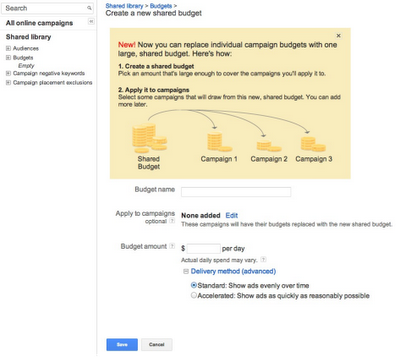 Log into the AdWords interface, then click Shared library, and select Budgets. Then follow the steps to Create a new shared budget (see image below). The “Shared library” is also where you can review aggregate performance metrics for multiple campaigns with a shared budget. For more on shared budgets, please visit the AdWords Help Center or the AdWords Community to ask questions or share tips. 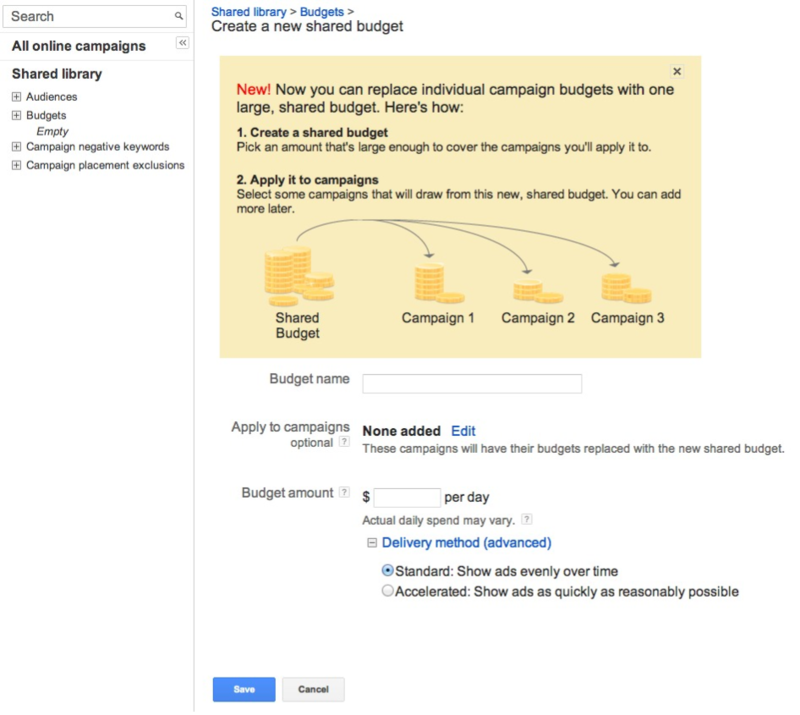 Shared budgets is a new feature that lets you establish a single daily budget that’s shared by multiple campaigns in an AdWords account. Shared budgets can make it easier to match your AdWords spending with how your business allocates marketing budget. And they can save you time and improve your AdWords results. Let’s see how with an example.